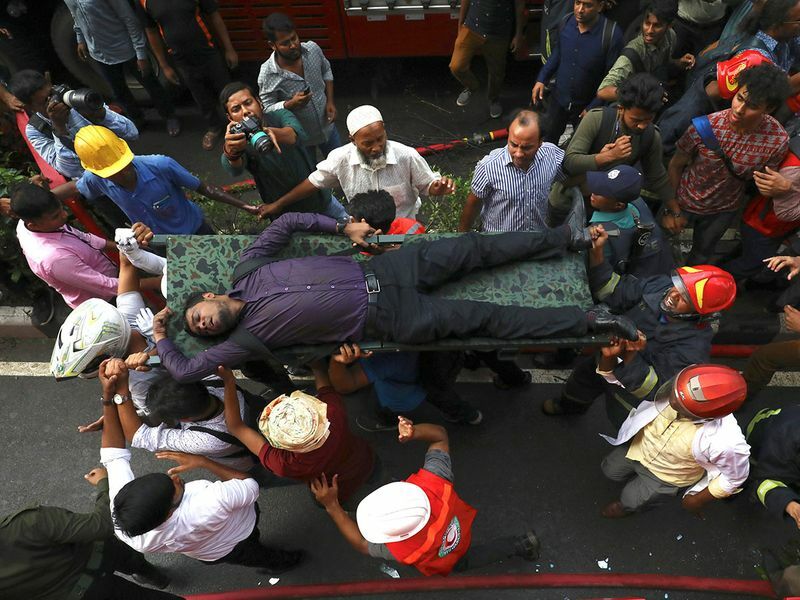 Desperate workers leaped to their deaths as a huge fire tore through a Dhaka office block Thursday, killing at least 19 people and trapping others in the latest major inferno to hit the Bangladesh capital. Rescue workers warned the death toll could rise sharply as fire fighters recovered charred bodies from the complex where an unknown number of office workers were engulfed by intense smoke and flames. At least six people died after jumping from the 22-floor building, officials said. Dhaka police chief Asaduzzaman Mia told reporters at least 73 people were injured and being treated in hospitals across Dhaka. 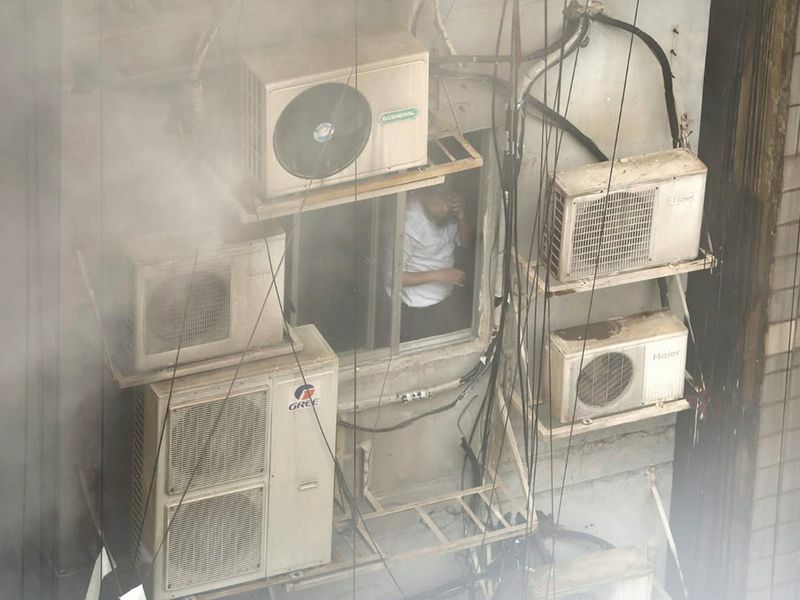 People were seen screaming for help as hundreds of panicked onlookers crowded the streets of the upmarket Banani commercial district. Some workers slid down a television cable on the side of the building. Others grabbed ropes lowered by emergency service helicopters which pulled them out of the blaze. The inferno erupted barely a month after at least 70 people were killed in Dhaka apartment buildings where illegally stored chemicals exploded. The latest disaster brought new scenes of horror amid fears that the toll would rise. More than 100 ambulances were parked in streets around the building. Shoikot Rahman heard colleagues raise the alarm and ran to safety before smoke and flames engulfed the building. "When I heard a fire broke out in the building, I quickly rushed out," he told AFP. "Many of my colleagues are still trapped in the office." Firefighters on long ladders smashed windows to create escape routes. More than one hour after the blaze erupted people could still be seen on the 13th and 14th floors desperately waving for help amid clouds of black smoke. Army helicopters dangled ropes that victims grabbed so they could be lifted to safety, with crowds below cheering and applauding every time someone was rescued. Three hospitals reported that six men and women had died or arrived with fatal injuries after jumping from the office block. They included a Sri Lankan man whose body was taken to the army's Kurmitola Hospital. Dilkhosh Ahmed at the Banani Clinic said one of the victims had attempted to use the television cable to climb down, but slipped and fell around the eighth floor. A seventh death from burns was recorded at the Dhaka Medical College hospital. Helicopters were deployed to drop water on the blaze as scores of firefighters backed by navy and air force specialists struggled to bring it under control. 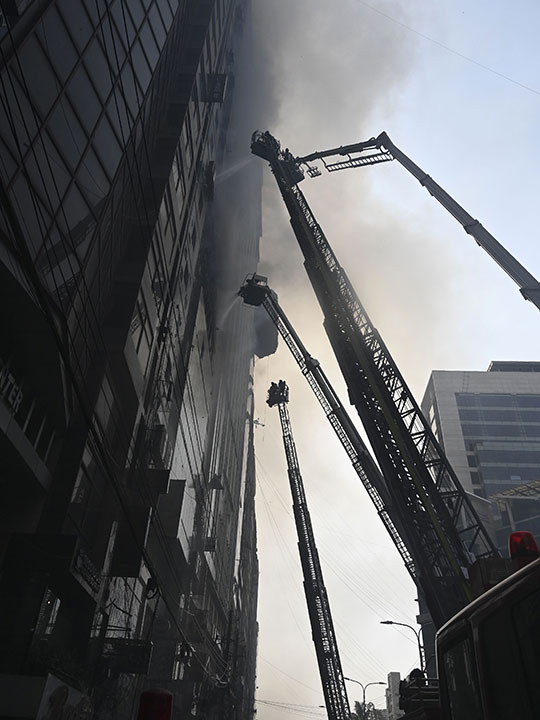 A top fire official said the flames had been stopped from spreading to adjoining buildings. "Teams have entered the building and they are scouring the floors for any remaining victims. 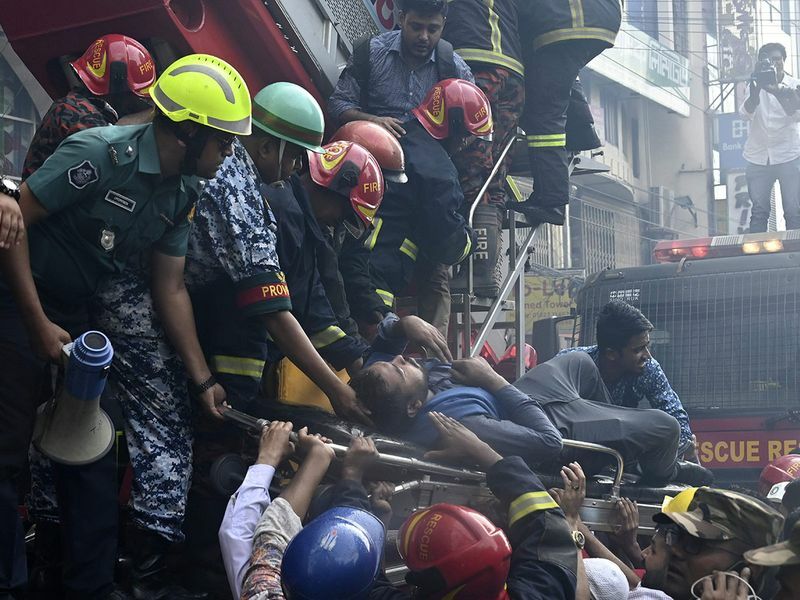 The building did not have fire fighting equipment," said Lieutenant Colonel Julfikar Rahman of the Dhaka fire service told reporters. Rescue crews were soon discovering bodies and carrying them out one after the other in white bags. "My uncle and two more people jumped from their floor. His hand and leg are broken and his eye is damaged," one man said without giving his name. A man who gave his name as Jico said he had been working on the 19th floor. "The fire started in a restaurant on the sixth floor. We ran to the roof as soon as we heard about it and then used a wooden plank to get over to the next building." 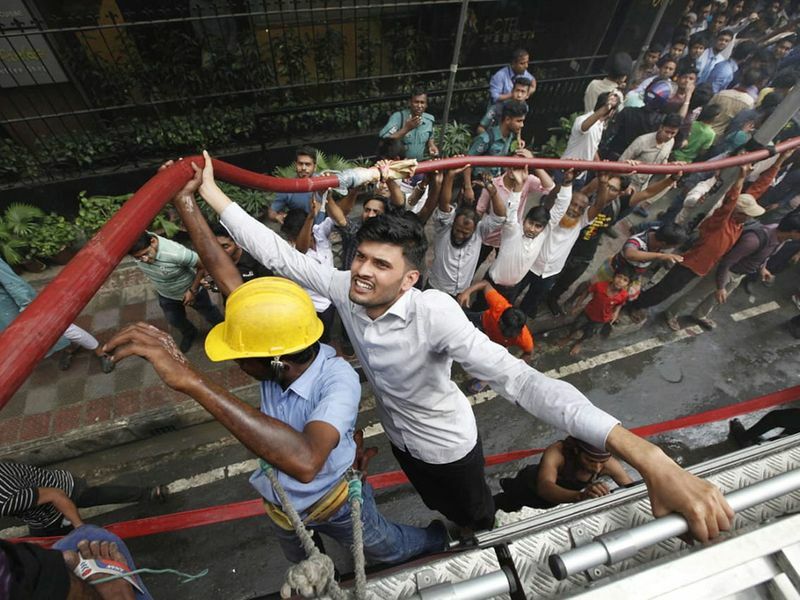 Fire disasters regularly hit Bangladesh's major cities where safety standards are notoriously lax. A massive blaze in Dhaka's old quarter on February 21 killed at least 70 people and injured 50 others. 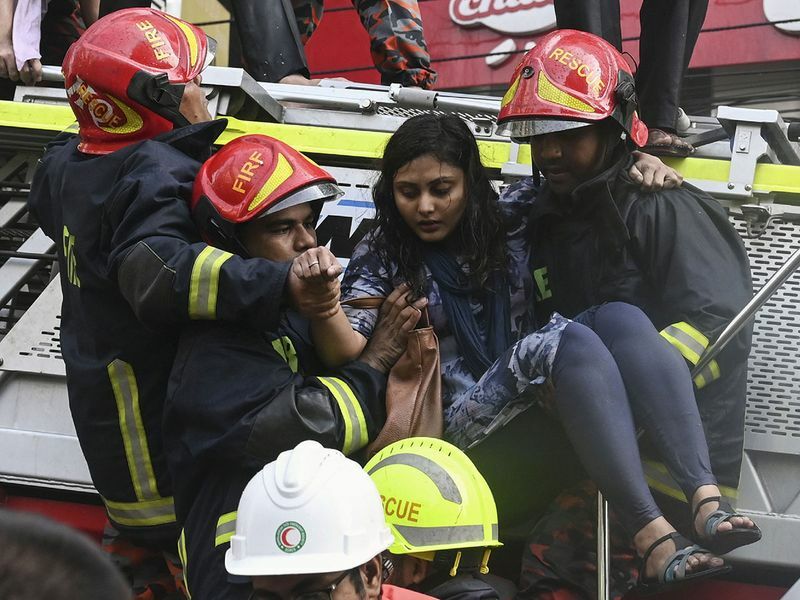 A fire in a high-rise office building in Bangladesh's capital on Thursday killed seventeen people and injured at least 28 others, officials said. "The situation is under control," said Debashish Bardhan, a Fire Service and Civil Defense deputy director. The fire had lost some of its intensity but was not yet fully extinguished, Bardhan said. Firefighters were shattering the building's glass walls to free toxic gas. 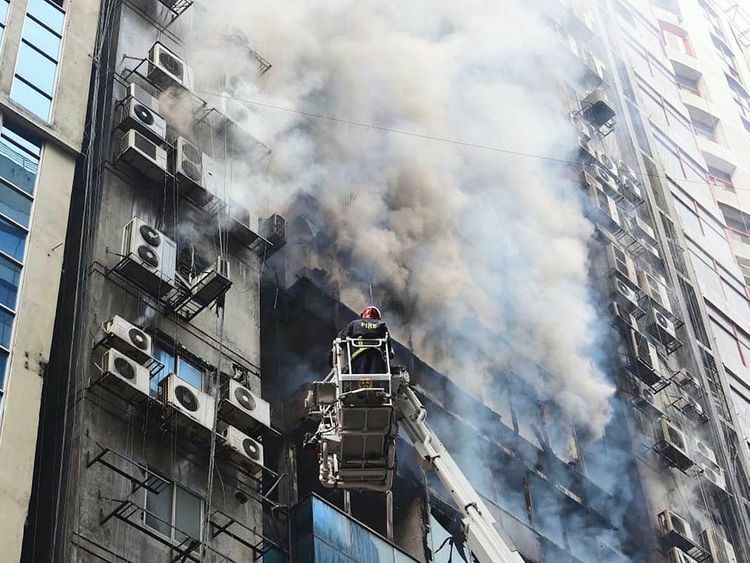 The fire at the FR Tower, located on a busy avenue in Dhaka's Banani commercial district, was the latest in a city where flouted building regulations and safety norms have made deadly blazes common. Banani police chief Forman Ali told reporters that seven people including a Sri Lankan had died and at least 28 others were injured. A Facebook Live video taken by Roy Pinaki showed five people climbing down from windows while burnt building materials fell around them. One person slipped from what appeared to be a rope that people were using to escape, bounced off utility wires and fell to the ground. Military helicopters joined the rescue operation, and one person dangled from a helicopter hovering over the roof as thick plumes of smoke rose. More than a dozen people who fled to the roof were rescued by firefighters using hydraulic cranes, Bardhan said. Witness Sajib Hasan said some people shouted for help from windows on the upper floors of the building. Heavy smoke deterred efforts by responders to get close to them, but Hasan said he watched at least a dozen people get rescued. Banani, the area where the fire broke out, is a busy commercial district with multistory buildings housing offices, universities and restaurants. Tushar-or-Rashid, an employee of the Vivid Holidays tour company on the building's first floor, said the fire began above them. "All of our staff have come out safely but we don't know what happened to the people who work in the upper floors," he said. Rashid said the building has 21 floors. Fires are common in Bangladesh. Last month, a fire in the oldest part of Dhaka, a 400-year-old area cramped with apartments, shops and warehouses, left at least 67 people dead. In 2012, a fire raced through a garment factory on the outskirts of Dhaka, killing at least 112 people trapped behind its locked gates. Less than six months later, another building containing garment factories collapsed, killing more than 1,100 people. Another fire in a house illegally storing chemicals in Old Dhaka killed at least 123 people in 2010.